Less windy, even cooler today. Today, winds will decrease as low pressure departs heading for Greenland. 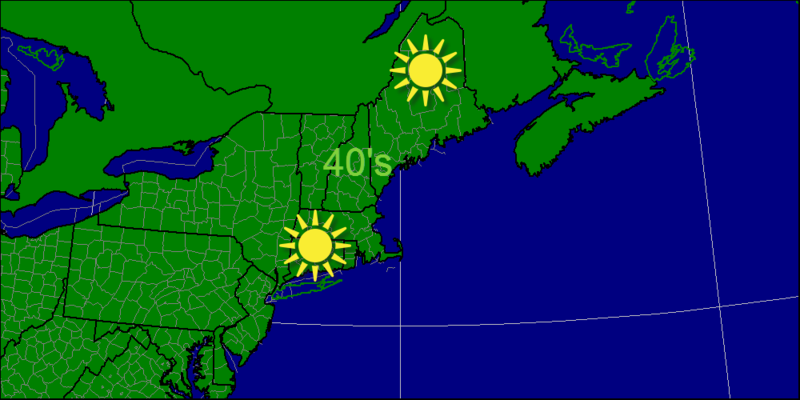 The cold air mass however, takes firm hold today with temps only in the 30’s and 40’s. Looking ahead, a warm up is in store late this week before another cold front passes through with another round of rain. Beyond that, early next week looks even colder. Today will feature much cooler temps as well as a nice cool wind. 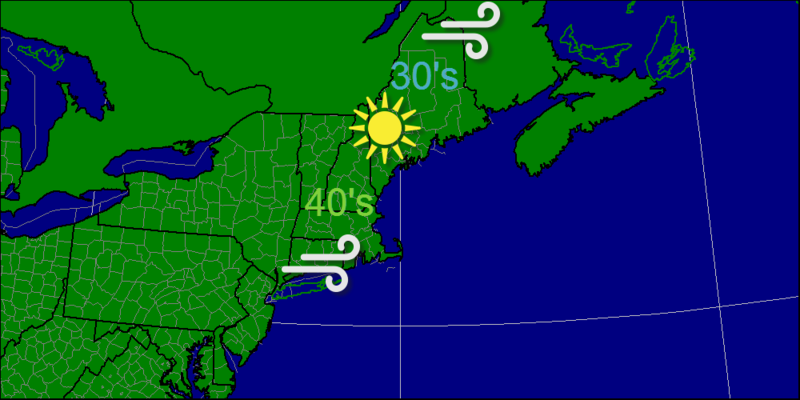 Winds will gust out of the W at 15-20 mph while temps will cap out in the 30’s and 40’s. Temps get even colder tomorrow before a lat week warming trend. 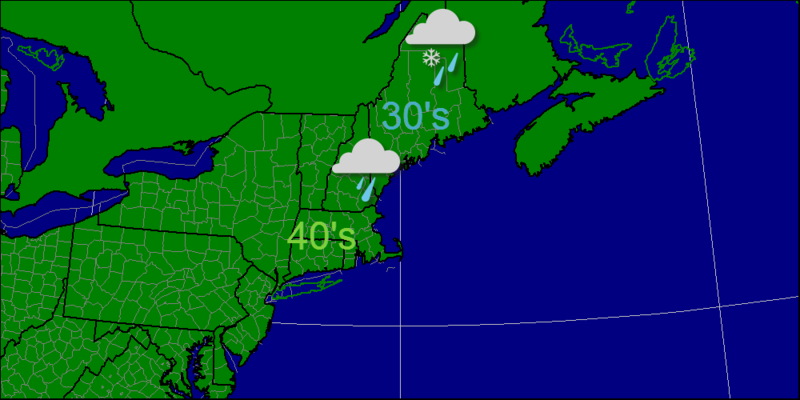 This morning a sharp cold front will pass through with a round of heavy rain and high winds. Winds will gust up to 40 mph out of the south in the morning hours so scattered power outages are possible. After the front, winds will gust to 30 mph out of the west. These winds will bring in much colder air for next week. Monday will feature the passage of a strong cold front bringing a line of heavy rains, high winds and even a rumble of thunder. The activity will be focused in the morning hours and will likely move out by 1-2 PM west to east. 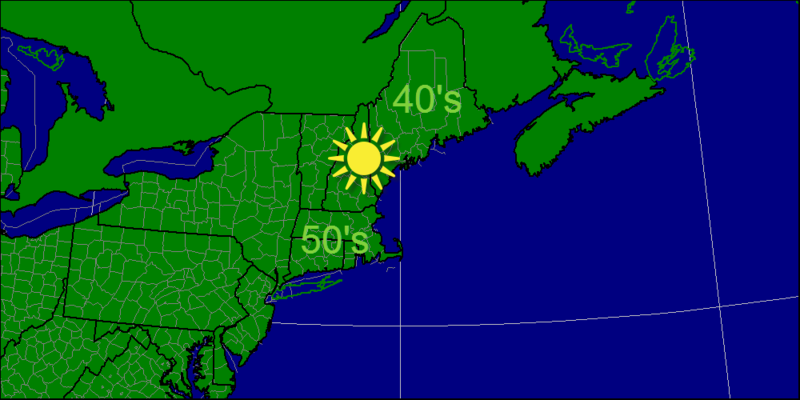 Temperatures will be warmest at the onset of daylight in the 50’s and 60’s while in the afternoon, gusty NW winds will bring in temps in the 40’s and 50’s. 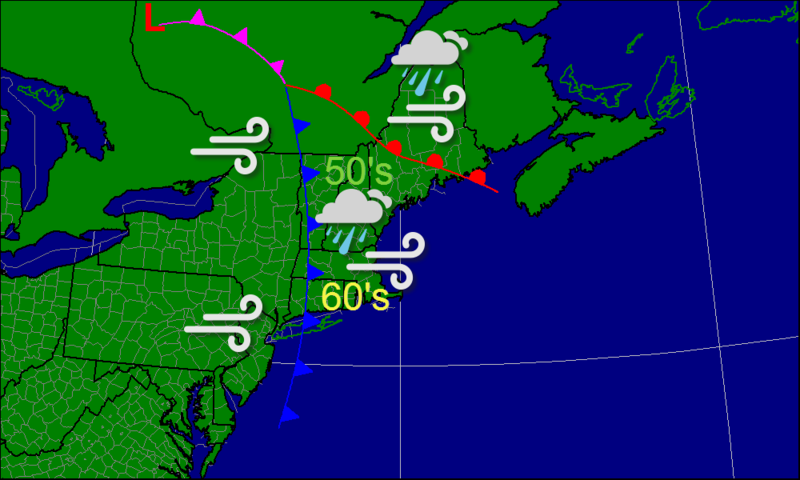 Winds will start from the SE ahead of the front and then shift to the NW after the front passes. For tonight, light sower activity will be the result of the passage of a warm front. winds will increase out of the south ahead of the cold front. Winds will gust 30-40 mph so scattered power outages are possible. For tomorrow, the day will be split half and half, the morning being wet and wild while the afternoon will be dry and windy with winds gusting out of the NW. Today will feature some patchy fog to start off the day but that will burn off in a hurry leaving full sun to be enjoyed for the remainder of the daylight hours. Warmer temps will continue to filter into the area with temps rising into the 40’s and 50’s. Warm temps continue through the weekend with a strong cold front marking a return to cold air on Monday.